The story of how Redfish Lake sockeye came to be endangered is as old as the development of the Pacific Northwest. First came overfishing, as early as 1895. Next came construction of the Sunbeam Dam in 1910 across the Salmon River. Under the headline "Greatest Fishing Ever," the Challis Messenger on May 17 of that year reported the carnage as the spring run of fish for the first time hit the dam, trying to ascend the barrier even through a tunnel blasting water with the force of a cannon. "They crowded each other out onto the banks and even the adjoining woods where they were left flopping around by the hundreds. Bears came on the run from the mountains and enjoyed the feast after their long winter fast. ... If anybody wishes to lay in a lifetime supply of fish now is the time. Fish flesh makes brains and brains makes money, and without money you are rated 'an undesirable citizen and an obstruction to progress and Civilization.' "
The mine powered by the dam failed within two years. But the dam remained until 1934, when it was finally partially blown out by the Idaho Department of Fish and Game. 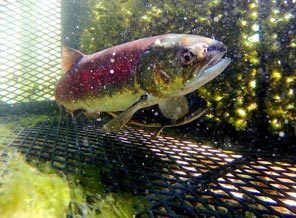 By then, sockeye runs were so depleted, the department poisoned most of the Stanley Basin's high mountain lakes and erected barriers to drive out what few so-called "rough fish" remained, in favor of stocked species for fishermen. But it wasn't until after completion in 1974 of the eighth major hydropower dam in the Columbia and Lower Snake River system that Snake River sockeye finally crashed.